A Piece Of The Action: Hallmark Ornament Spotlight- 2009 "The Menagerie"
The Rundown: Figured I better get all the 2009 ornaments up while it's still 2009... "The Menagerie" is one of Hallmark's "scene" ornaments, recreating a classic scene from either the movies or television shows. 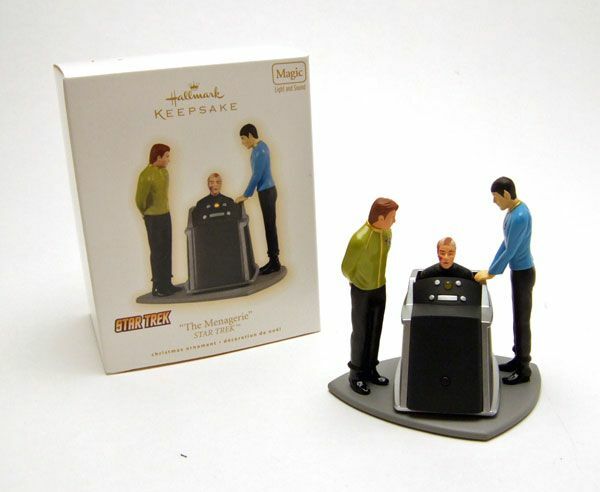 In this case, it's the closing scene from the fantastic Star Trek 2-parter "The Menagerie". 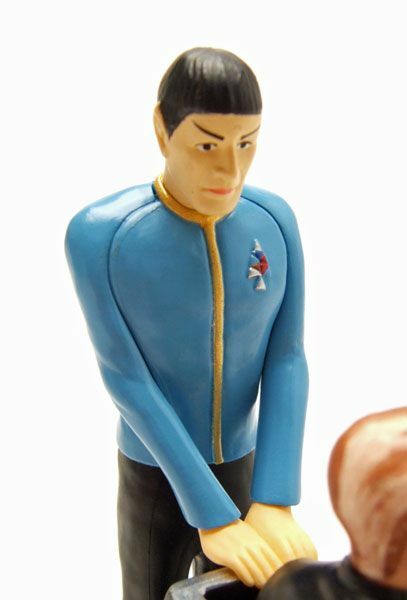 The ornament features 3 characters: Captain Kirk, Spock, and the disfigured Captain Pike (nothing says the holidays like an irradiated Captain Pike). 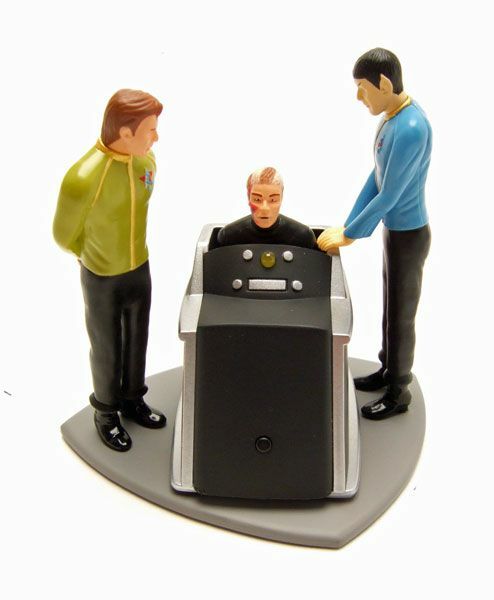 In the scene, Spock has just been acquitted of mutiny, and Pike is on his way to live out the rest of his life on Talos. 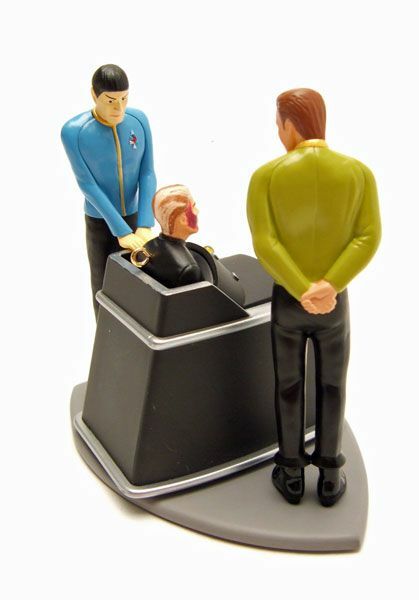 It's a good choice for a scene to depict, what with it's "feel good" nature and the ability to add an electronic feature to Pike's chair. 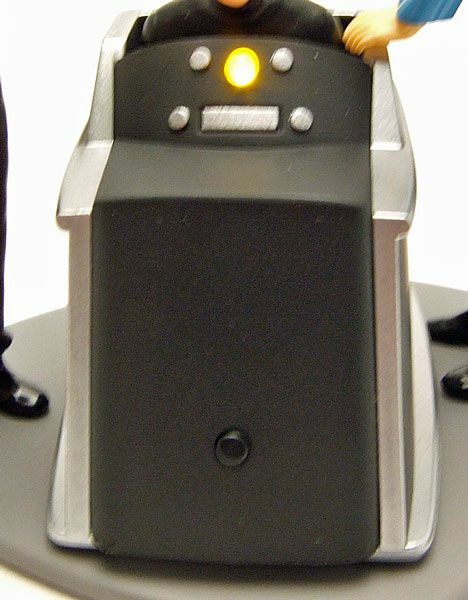 Pike would signal one blink for "yes, and two blinks for "no" in the episode. 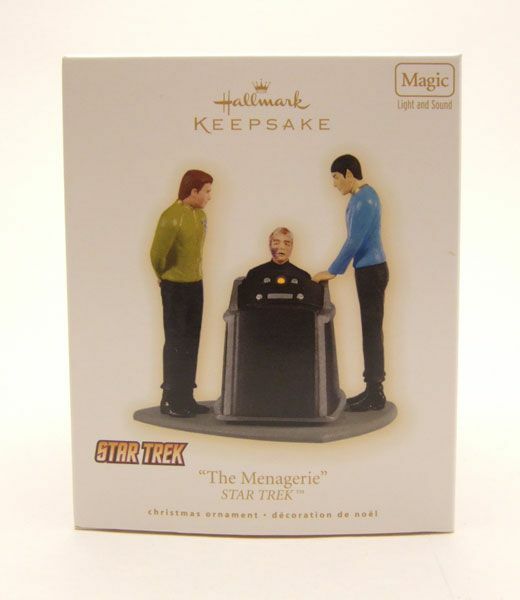 Since this is one of Hallmark's "Magic" ornaments, the feature is recreated here. The ornament runs on 3 small batteries (included). 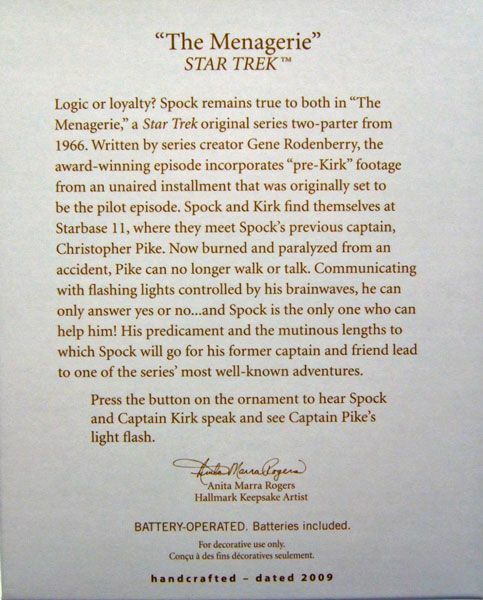 Batteries seem to be the method of power that Hallmark has totally switched over to on the Trek ornaments. I actually prefer the batteries on this kind of ornament over plugging them into lights on a tree; you're not going to have this on all the time, and it makes it possible to turn this into a nice shelf display piece when the holidays are over. The electronics all function well and are of nice quality. The light is pretty bright, and the sound clips are clear and loud. 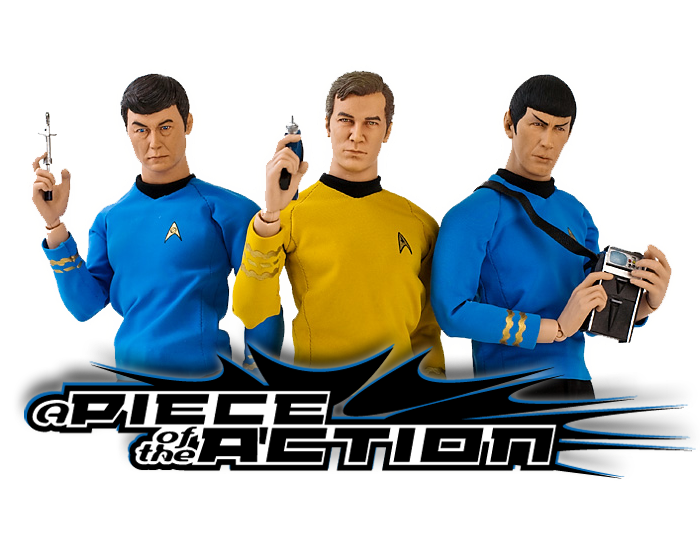 The sculpts on all three characters are pretty nice, considering the scale.It's tough to achieve dead-ringer likenesses when you're working at this scale, but they do look enough like the characters that you can tell who's who. 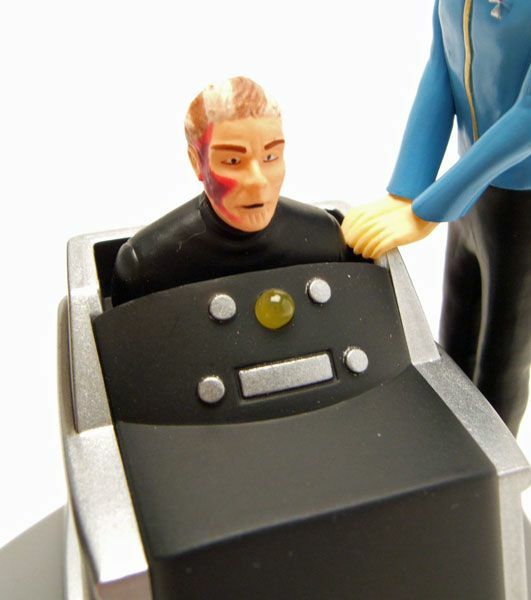 The sculpt on Pike's chair is especially nice. The paint job is really nice and clean on these guys too. 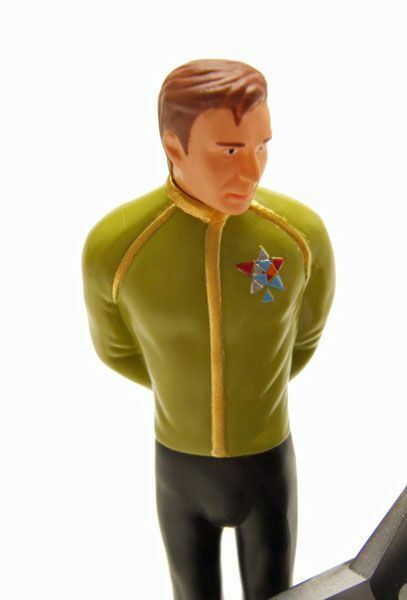 The lines are straight and nice, and even small details like the decorations on Kirk & Spock's dress uniforms are really clean. I'm really amazed they deliver such clean, even paint jobs on something this small.